US and Canada efforts towards cleaning up PCBs and other toxic chemicals in Au Sable river and Lake Huron. IJC Acting Canadian co-chairman Gordon Walker will moderate the panel discussion. “Lake Erie is clearly in trouble,” Walker said. “We need an active and informed citizenry as well as commitment from all levels of government to fix the problems. “In cases where harmful algae blooms (HABs) appear, municipal water treatment facilities drawing water supplies from Lake Erie may need to carry out additional treatment before the water is safe for human consumption,” the report said. It noted that a survey of 15 public water systems in Ohio showed that 10 used additional treatments on lake water as a result of HABs. “These treatments included the application of powdered activated carbon, chlorine dioxide, and potassium permanganate. Additional control costs totaled $417,200 for the 10 water utilities, ranging from individual plant costs of $400 to $240,000. It is important to note that algal bloom events of 2009 were less severe than in 2011, and as such, these costs can be seen as a conservative estimate,” the report said. Ratepayers are wary of the issue, as well. “Public concerns about the impact of HABs on drinking water in Lake Erie were heightened in the summer of 2013,” the report said. Lake Erie has not always faced such tough health problems. “Once a success story about how a polluted lake can be brought back to life, [it] is once again struggling to survive,” CBC News reported. The IJC is trying to fight for the lake. Along with releasing the report, the body “announced an ambitious plan to improve the water quality in Lake Erie,” according to The State Column. 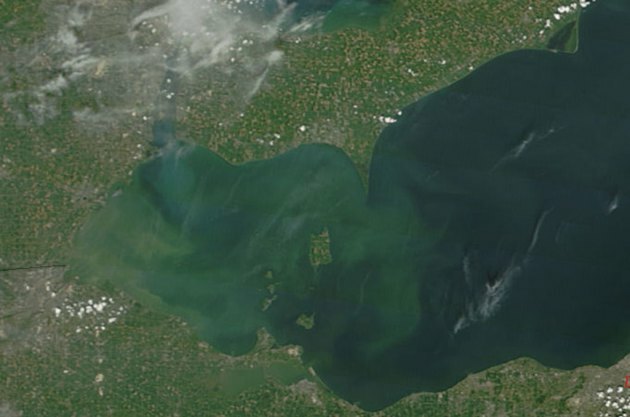 It proposed “a 46 percent cut in the average annual phosphorus load in Lake Erie’s central and western basins to reduce the hypoxic dead zone, and a 39 percent cut in the average annual phosphorus contributed by the Maumee River to reduce harmful algal blooms,” Circle Of Blue reported. The group tried to make sure its recommendations would actually go somewhere. MP Bruce Stanton encourages his constituents of Simcoe North to Petition the IJC for solutions to Low water levels of Georgian Bay. The IJC is the ‘center for action’ on the solution for this issue. Mary Muter of the Sierra Club of Ontario remarked at the Oakwood Community Centre that ‘the IJC has had $17 million and seven years to come up with a solution’. IJC recommendation to do nothing is not popular among these folks. The US Army Corps of Engineers solution for low water levels for Georgian Bay was conceived 50 years ago. According to Muter, water flows would be slowed by installing underwater sills and repairing erosion damage. As reported by Sarvus, the project costs today would range from $100 to $200 million over 10 years with start up of $3 to $5 million. Muter and Scott Warnock [Tay Township Mayor] expressed their dismay with the IJC at last summer’s meeting in Midland that was attended by about 600 people with their ears open for solutions. “They provided no viable options for water level restoration. “It means do nothing and get used to it, folks,” said Muter. An excerpt from local paper A member of the audience asked if the water levels will continue to decline if nothing is done. Muter said that’s exactly what will happen because there are no water regulation systems on Georgian Bay and Lake Huron as there is on Lake Ontario, which has remained relatively stable. Lakes Simcoe and Couchiching drain into Georgian Bay and the five Great Lakes drain, eventually, into the Atlantic Ocean. All five Great Lakes are at lower levels than normal, but lakes Huron and Michigan have lost more water than the others. Human manipulation of the St. Clair River that drains Lake Huron into Lake Erie is one of the areas that is a major cause of the lowering of Lake Huron water, said Muter, and it’s the area where remedial work should start. “The reality is that it is possible to restore water levels,” she said. The St. Clair River has become a drain from Lake Huron because of a century of human intervention that includes mining, repeated dredging, removal of wetlands and creating a steel wall on the U.S. side that causes water to flow faster and causes more erosion that results in an even deeper channel. This is really something to be excited about! Act now!